A BEAUTIFUL version of “Tomorrow Is A Long Time”. It’s a great song. Being played by great players. The highlights of these shows each night were the stripped down performances. The shows with the Dead have gotten a bum rap. They were a bit ragged but magic would appear every night, much like the 1987 shows with TP. Been going to see Dylan since 1978. Now for sheer, unadulterated joy, give me 1988. It has been a great ride, but all downhill from there. To think this soulful performance was only three months or so after the miserable Dylan & The Dead shows, where soul, application & belief where in such short supply. This lightening quick six week tour of Israel & Europe with The Heartbreakers is for me one of the highlights of Bobs performing career. I would love to see him tour with those guys again, and yes! bring on The Queens of Rhythm too. I think they would seriously compliment Bobs current vocals. Thank you for this! 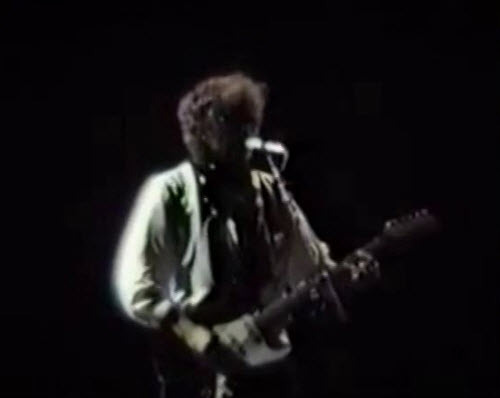 Once again a Bob Dylan performance made my day! whoa…he outdid even himself here…it brought tears to my eyes !